Contractors for the 13th Avenue Road Reconstruction and Infrastructure Improvement Project have reopened the south side of the intersection of 13th Avenue and 16th Street East in West Fargo. All turning movements for the intersection have been restored. Crews are currently working on the center of the intersection of 13th Avenue and 45th Street South. Late Sunday evening traffic control will be shifted for the final phase of work in the intersection. Early in the morning Monday, July 2, crews will begin concrete removals in the southwest quadrant of the intersection. 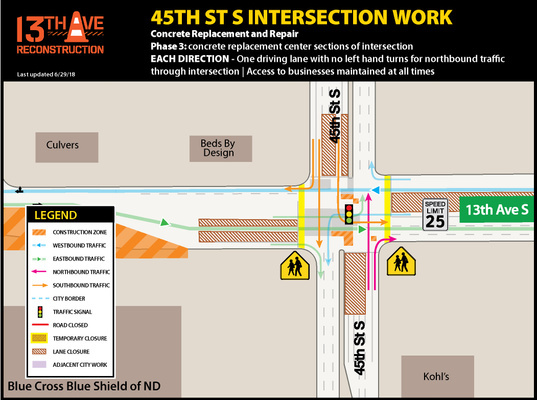 During this phase of work northbound drivers on 45th Street S will not be able to turn left onto 13th Avenue. 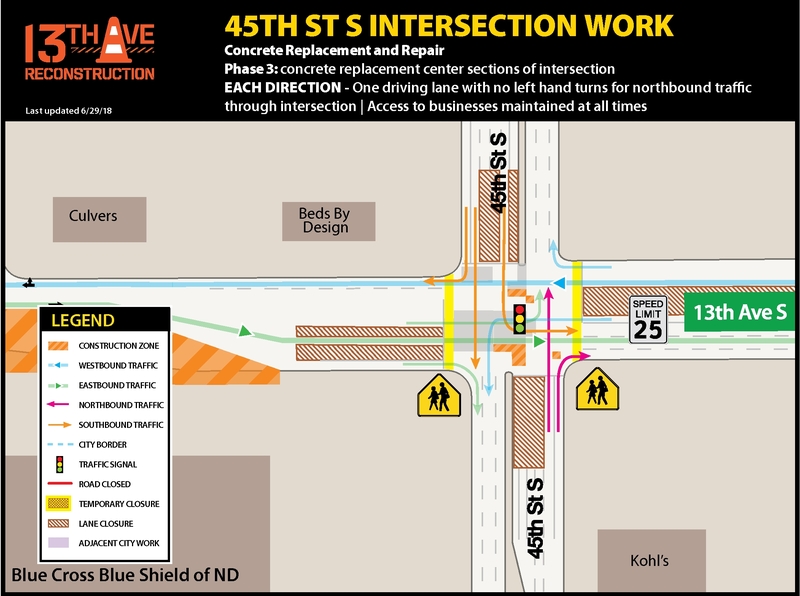 Eastbound 13th Avenue drivers will now be able to turn left to northbound 45th Street S. Drivers are encouraged to use alternative intersections to continue in these directions. 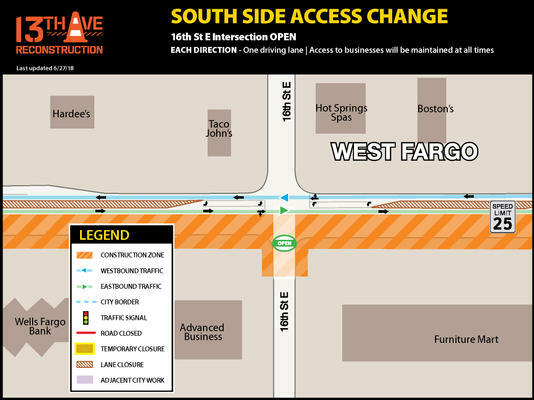 On 13th Avenue between 45th Street South in Fargo to 12th Street East in West Fargo, traffic will continue to be carried head-to-head, plus turn lanes, on the north side of the street through the work zone. All other intersections will remain open as crews continue with construction activity on the south side of the street. PROJECT WORK: Crews installed a new water main on the south side of the intersection. PROJECT WORK: Crews will be replacing sections of existing pavement that has started to deteriorate with new concrete pavement to extend the overall life of the intersection. Sidewalks: North to south pedestrian crossing is at 9th or 45th Streets. To access commerce or travel through the area, drivers are encouraged to use alternative routes for their east-west driving on alternative area roads.